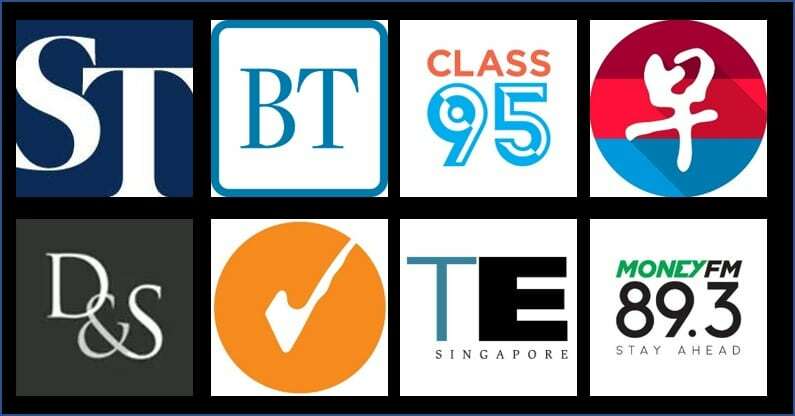 Applications received before 28 Feb 2019 will be eligible for an enhanced sign up gift of 40,000 miles, making this one of the cheapest ways to buy miles in Singapore. HSBC’s Visa Infinite has an annual fee of $650, although you only pay $488 if you’re a Premier Banking customer. Historically, you get 35,000 miles with your annual fee, but HSBC has from time to time increased this to 40,000. It appears to be time of year again, because applications for the HSBC Visa Infinite submitted between now and 28 Feb are eligible for a sign up gift of 40,000 miles. Here’s how the math looks like, depending on the annual fee you pay and how many welcome miles you get. This is one of the cheapest ways to buy miles in Singapore, assuming you’re a HSBC Premier Banking customer. The fact that the cost per mile is below our magic 2 cents figure means that even if the card didn’t have any other benefits, you might be satisfied paying the annual fee for the miles alone. However, the HSBC Visa Infinite does come with other benefits, which we’ll look at below. Sorry, but I’m really skeptical about those valuations. I get that it’s subjective, but I certainly wouldn’t value expedited immigration at $1,260 a year. Likewise, I think it’s pushing it to say that travel insurance is worth $988 a year, given that you can find equally comprehensive annual plans for about $250-300 (plus, the HSBC VI’s travel insurance only kicks in if you use the card to pay for your travel). The card has other useful benefits like a complimentary Entertainer app and dining benefits at Marriott Tang Plaza, and if those tickle your fancy you should definitely acquaint yourself with them before pulling the trigger. I’m just going to zoom in on what I see as the key benefits of a travel card: miles earning, limo transfer and lounge access. 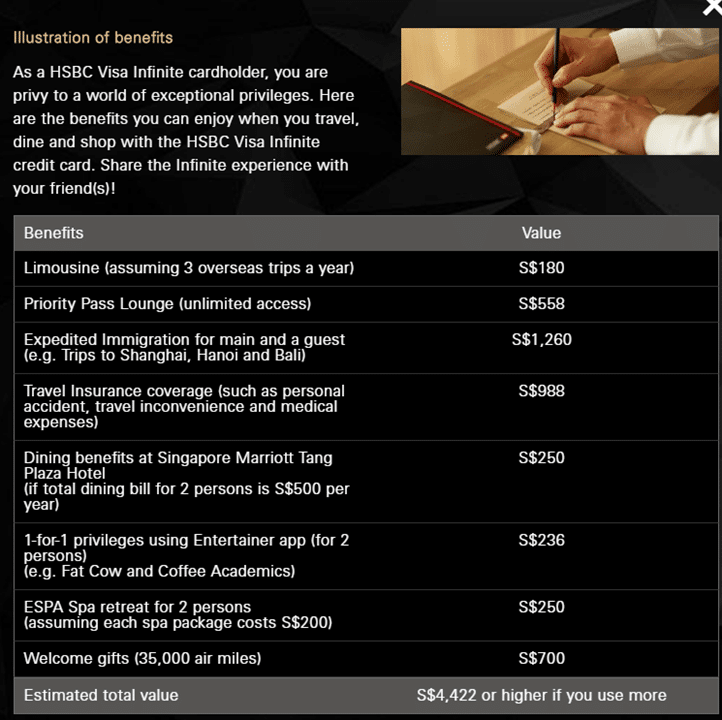 For a card in the $120K segment, the HSBC Visa Infinite’s earning rate is pretty abject. You earn an abysmal 1 mpd on local spending, and only unlock the 1.25 mpd rate by spending at least $50,000 in a year! Other $120K cards give you up to 1.4 mpd on local spending, so the HSBC Visa Infinite is definitely not something you hold for the miles earning potential. The overseas earn rate is on par with other cards in the market at 2 mpd, and if you unlock the step up rate you’ll be outperforming holders of the Citi Prestige and UOB Visa Infinite Metal card. So it’s a bit of a strange contrast- paying the HSBC Visa Infinite’s annual fee is one of the best way of buying miles in Singapore, but using the HSBC Visa Infinite to earn miles from everyday spending is a bad deal. The HSBC Visa Infinite offers two complimentary limo transfers a year, with no minimum spending required. Subsequently, cardholders can unlock an additional transfer for every $2,000 spent in a month. It’s a relatively low spending threshold compared to other cards (special mention for the Citi Prestige, which allows you to unlock up to 4 transfers with a $1,500 overseas spend). The HSBC Visa Infinite comes with an unlimited-visit Priority Pass. No free guests are allowed with this version of the pass, but your supplementary cardholder can also get an unlimited-visit Priority Pass for him/herself. In contrast, the Citi Prestige does not offer a Priority Pass for the supplementary cardholder, but the principal cardholder’s Priority Pass comes with 1 free guest. The HSBC Visa Infinite would therefore work better for couples who travel separately, while the Citi Prestige offers more flexibility for the principal cardholder to guest in a spouse/colleague/relative/friend or whoever he/she is traveling with. If you’ve had your eye on the HSBC Visa Infinite for a while, the upsized sign up gift should be good incentive to apply now. Quite frankly, I don’t feel the benefits are anything to shout about (the Citi Prestige is still my card of choice within that segment…although that may change if they nerf the 4th night free benefit), but if you’re just in it to buy miles then it’s hard to argue with those valuations. Final point: there are no SingSaver sign up gifts for the HSBC Visa Infinite this month, so feel free to apply via the official channels. Signing up for credit cards through any of the links in this article may generate a referral commission that supports the running of the site. Found this post useful? Subscribe to our Telegram Channel to get these posts pushed directly to your phone, or our newsletter (on the right of your screen) for the latest deals and hacks delivered to your inbox. anything i can do if i did not meet the income requirement? the best thing about this card is that you can apply up to 5 additional supp cards, each of which is entitled to an unlimited visit priority pass. if you are a hsbc staff, the annual fee goes down to $248, while still entitling you to 35k miles (when I applied a few months back). hi, anyone know how many miles we can get from paying annual renewal fee? Principal cardholders of the Maybank Visa Infinite are allowed to bring one guest free to the Priority Pass lounges. Supplementary Cardmembers and accompanying guests will enjoy a preferential rate of USD27 per person per visit. Next Entry Should you pre-emptively book awards now to avoid the KrisFlyer devaluation?